Just last week I was talking about how it had been five years since I read the first novel in the Ki-Gor series. Well, it’s been more than six years since I read the first Black Bat novel, and now I’m back with the second one, MURDER CALLS THE BLACK BAT, reprinted by Altus Press from the September 1939 issue of BLACK BOOK DETECTIVE. The Black Bat, for those of you who don’t recall, is former district attorney Tony Quinn, who, like another famous former DA, Harvey Dent, has acid thrown at him in a courtroom. Unlike Dent, who is disfigured and becomes the villainous Two-Face, one of the most prominent members of Batman’s Rogues Gallery, Tony Quinn is blinded by the attack and faces a bitter life of unending darkness. But then he meets a beautiful young woman who arranges for him to have a mysterious surgery that not only restores his sight, it allows him to see even in pitch blackness. Blessed with this unexpected ability, Quinn decides to pretend to still be blind so he can don a black hood and fight crime as the mysterious and somewhat sinister Black Bat. He recruits his lovely blond benefactor, Carol Baldwin, to help him in this quest, along with former confidence man and reformed small-time crook Silk Kirby and a big palooka named Butch. The cops, of course, think the Black Bat is just another criminal, so they’re determined to catch him, especially dogged Sergeant McGrath, who’s convinced Tony Quinn is the Bat despite his apparent blindness. Police Commissioner Warner suspects Quinn, too, but he realizes how much good the Bat is doing and is ambivalent about catching him. In other words, this series marks just about every check box in the masked vigilante genre, so whether or not it’s any good depends almost entirely on the quality of the writing and the cleverness of the plots. In the case of the Black Bat, most of the novels were written by Norman A. Daniels, one of the most dependable pulpsters in the business before he went on to a long and also successful career as a paperbacker. I’ve always regarded Daniels as a solid member of the second tier of hero pulp authors. His work lacks the spark that makes Lester Dent, Walter B. Gibson, and Norvell Page superstars in that genre, but his stories are always well constructed and move right along without too many implausibilities. MURDER CALLS THE BLACK BAT has to do with a gang of jewel thieves who are able to steal gems right out of jewelry stores and substitute top-notch paste replicas. Tony Quinn is drawn into the case because one of the store owners is a friend of his. 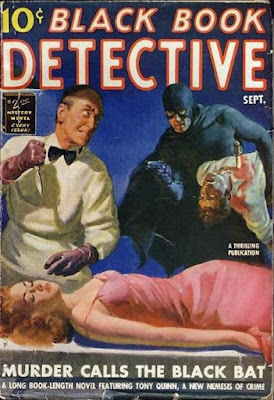 There are several murders and a bunch of suspects, the Black Bat and his allies get captured and escape a number of times (the best scenes in the novel take place in an abandoned sewer tunnel during one of these sequences), and finally the Black Bat manages to get all the characters together to reveal the mastermind behind the whole scheme. It’s a little on the bland side and the resolution could have been more dramatic, but overall this is an entertaining yarn. It’s a lot better written than the Ki-Gor novel from last week—but the Ki-Gor was more fun, if that makes sense. I’ll read more of the Black Bat, which also is supposed to get better as it goes along, and I hope it won’t be six years before the next one. I've enjoyed all the books from Altus Press that I've read. I haven't read any BLACK BAT stories, but they sound fun. I'll have to order some. The first B-B story, BRAND OF THE BLACK BAT, has been reprinted several times. Tom & Ginger Johnson did it in chapbook form. I think Adventure House did, in an issue of High Adventure. Hands, in Greece, reprinted many/most/all of them in sub-digest format. I have MURDER CALLS THE BLACK BAT, and several other Hanos editions down in the Culture Vault(tm). Now Altus and Nostalgia are both reprinting the series.